Since publishing the 49 Class page in mid 2010, a number of changes have occurred to the surviving fleet of 49 Class locomotives. Lachlan Valley Railway purchased 4903 and 4906 from Patrick Portlink in June 2011, transferring them from Port Botany to Chullora for general maintenance work (given that the locomotives had been sitting in a siding at Port Botany for 12 months, minor work was to be inevitable). The locomotives were then transferred to Lithgow for the painting over of the Patrick logos, as well as the removal of the graffiti these units had attracted in their last months of revenue service. The two 49 Class were immediately pressed into service to operate a charter service to Moree over the last weekend of June 2011, for the centenary of the Garah Picnic Races. Despite not being in “original, as built” condition, these locomotives are a valuable record in the history of the class, and they can proudly sit alongside their “original” classmates 4916 and 4918 as a record of what the brave world of private enterprise held for the class. LVR does plan to repaint the units when time and funding permits. At this stage, the colour scheme has not been revealed. As a personal note, it would be nice to see these two units painted in a non-heritage scheme. Given that they are not as built, it would be inaccurate to see them repainted into a government railways scheme. While one could argue the only true “heritage” scheme is the one that they are currently wearing, it is a bold opportunity for LVR to come up with a unique colour scheme to best suit their new acquisitions. Perhaps a colour scheme to match the new luxury “Blue Zephyr” air conditioned heritage train also under restoration in Lithgow? One thing is for sure, when I last detailed these two locomotives, it was thought that it might finally be the end of the road for them – set aside after failing on their Patrick PortLink duties only weeks before their parent company closed down their rail operations? It is good to see these veterans once more gifted with a new lease of life. Considering the two units were once owned by QRNational with the intention of using their bogies for more 423 Class, they are lucky to have survived! The other 49 Class used in this project were not so lucky, all of which have been scrapped. (The topmost image was taken on the day the two 49’s were set aside, while the lower two images were taken after the two units passed into LVR ownership. Click on the below images for larger versions). 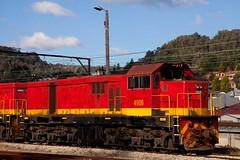 After leasing the three “KL Class” from CFCL Australia for many years, SSR purchased these three locomotives during August 2011. All three locomotives would cycle through the CFCLA workshop at Goulburn for overhaul and repainting, with all three 49 class released with their original identities. 4904 (KL80)was the first to emerge in full SSR colours during July, followed by 4917 (KL82) in August and 4910 (KL81) in December. 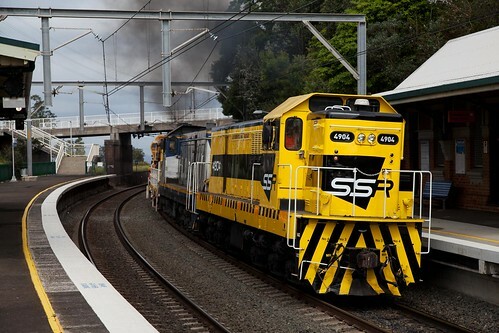 All three locomotives had returned to regular use on SSR operations for RailCorp and ARTC by the start of 2012. 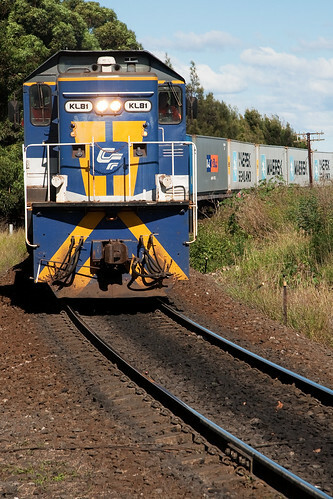 Perhaps the most surprising development of 2011 was the transfer of 4911 from EDI Kelso to SSR Bendigo. 4911 had been stored at EDI Kelso since being purchased by the Manildra Group. The conversion of 4911 into an MM Class shunter never eventuated, and the unit was eventually sold to SSR in April 2011, being transferred by road to Bendigo. SSR have begun to overhaul the unit to re-enter service. 4901 (scrapped by QRNational at Casino, 2008). Bogies used for 423 Class. 4902 (stored, Seymour, Victoria). Bogies used for the 423 Class. 4903 – LVR, operational. Patrick Red livery. 4904 – SSR, operational. SSR livery. 4905 – Traction Engineering, Seymour Victoria. Used for static traction motor testing. Bogies used for 423 Class. 4906 – LVR, operational. Patrick Red livery. MM01 (4907) – Manildra Group, operational (shunter at Manildra). 4908 – Engenco, operational. 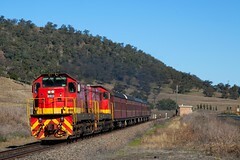 In lease service at Broken Hill with South Spur Rail Services (Qube Rail). 4909 (scrapped by QRNational at Casino, 2008). Bogies used for 423 Class. 4910 – SSR, operational. SSR livery. 4911 – SSR, overhaul in Bendigo, Victoria. 4912 (scrapped by QRNational at Casino, 2008). Bogies used for 423 Class. 4913 (MM02) – Manildra Group, operational (shunter at Gunnedah). 4914 (scrapped by QRNational at Casino, 2008). Bogies used for 423 Class. 4915 (scrapped by NSW SRA at Cardiff, 1989). 4916 – NSW Rail Transport Museum, operational. 4917 – SSR, operational. SSR livery. 49 Class Photo Gallery (link opens in a new window).